I have just spent several hours (almost all day) trying to add some provenance to a daguerreotype I purchased back in the 1970's. I kept it all this time because it always fascinated me as a piece of history. You seem to have to have an incredibly vast amount of knowledge on your website. I was wondering if you can identify the locomotive in the attached pics. I want to sell the dag but would like to be able to identify what it is. It’s almost identical to the Baldwin logo and several other Baldwins, but not precisely. There is a swerved wheel cover over the back wheels and the placement and shape of the bell, water reservoir or other items on top of the tender is a little different. Since it’s a dag, it’s a reverse image so I have flipped it for you. It says MADISON on the side of the tender but I am unable to read anything else (except the sign on the door of the building says “Cash Store”). The car looks like it says something like “I P & E R ___” ? I’m originally from Minnesota and we had a lot of Erie RR’s. In research I’ve seen the Indianapolis & Pennsylvania referred to and the Wabash & Erie, but nothing with this combination. Research also shows what a great monumental undertaking it was to construct an engine that would get over the grades to the Ohio River in, Madison (Ohio ? ), and the Reuben Wells' success, and I’ve read a little of the Wabash Canonball (I think we learned that when we were kids). But I still can’t find this particular engine or a possible location. It is such a magnificent specimen and looks like it is standing proud and brand new that I thought you might recognize something about it. All I have to offer is my thanks and appreciation for your response. Behind the locomotive, there is a building with a sign above the door (above the locomotive cab). 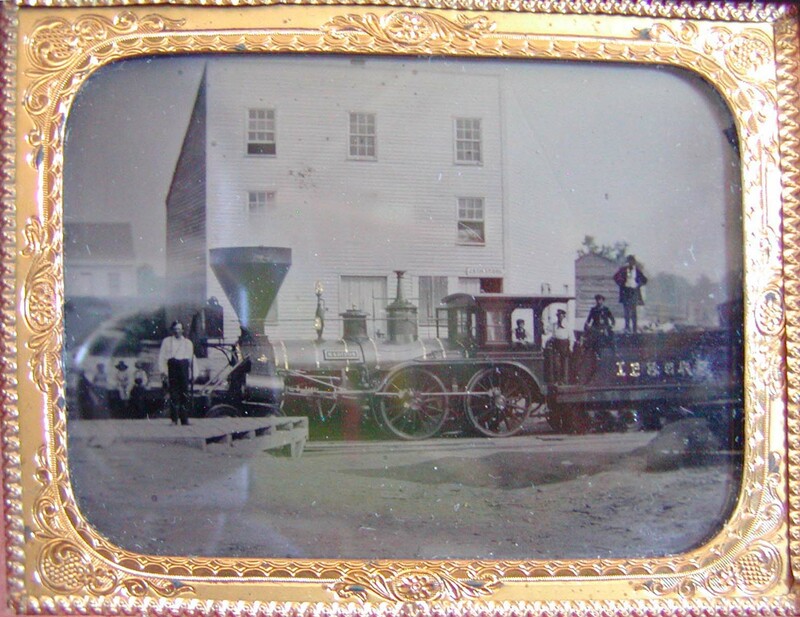 Is the sign legible on the daguerreotype with a loupe or microscope? What does the sign say? Thank you for taking an interest in this dag. The sign says "Cash Store." I was hoping it might be a bigger clue but maybe it is. I've looked at a few depot pics but couldn't find it. If a glass surface cased image does not behave as a mirror, it is most likely an ambrotype rather than a daguerreotype. The daguerreotype is an image made on polished metal preserved behind glass, while an ambrotype is an image on glass. "Let the naming game begin"
"The Iron Horse: The way to Sierra winter sports"
"Central Pacific’s unlucky Tunnel 13"